Serve multiple radiation detection applications with one versatile instrument. 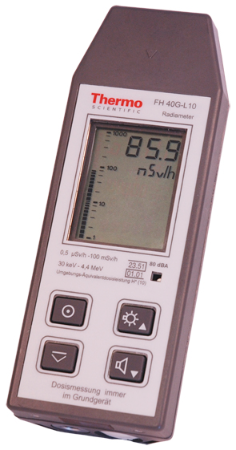 The Thermo Scientific™ FH 40 G is a wide range digital gamma survey meter suitable for nearly all measurement tasks arising in radiation protection through optional plug and play probes available for neutron measurement, alpha and beta contamination readings and even to detect artificial gamma radiation in variable natural radiation fields. The FH 40 G is a versatile multipurpose meter and area monitor that can be used with external detectors for portable and remote area monitoring applications. Rugged, waterproof and reliable with very simple operation. Gamma meter with internal proportional counter tube. Integrated gamma dose rate measurements. Interface for one optional, external plug and play probe. Alarm thresholds for the internal detector and external probes of the FH 40 G are monitored simultaneously. Upon connection of an external plug and play probe, the probe parameters are automatically read into the FH 40 G and the correct parameters are set. High voltage generation inside the plug and play probe makes the system calibration independent of cable length. Separate alarms can be set by the user for both the internal and external detectors. Operational internal proportional detector and connected external detector. Type tested by PTB (German version). Type tested for use by German fire brigades. Simultaneous operation of internal and external detectors, both dose rate and remote dose rate readings. Configuration and data read out via PC. Waterproof (IP 67) and shock resistant. ADF mode (Advanced Digital Filter). Internal diagnostics ensure proper functioning of the detector(s) and the electronics. Designed to record up to 256 data points containing measurement number, date, time and dose rate at the internal detector and external detector, status, and optional barcode information. Wide range of plug and play external probes for monitoring and detection. All FH 40 G versions and external probes containing the "-10" suffix are designed to meet the energy response behavior of the new SI-units ambient dose equivalent and ambient dose equivalent rate according to ICRU 39. Gamma dose rate measurement: FHT 192 (ionization chamber), FHZ 632 (proportional counter), FHZ 612 (wide range), FHZ 302/312 (under water nuclear power). Gamma search probes: FHZ 502, 503, 512 (NaJ/BGO). Contamination: FHZ 742 (Scintillator), FHZ 732 (Pancake/proportional counter), FHZ 382 (Scintiallator + Alpha/Beta discriminator via LED indication if alphas are present). Aritificial radiaiton discrimination: NBR probe FHZ 672. Preamplifiers for various classic probes. Wide range of accessories like cables, telepoles, application specific kits, etc.